Young Lungs Dance Exchange with support from aceartinc. is pleased to present a workshop by Katie Lyle and Shelby Wright. 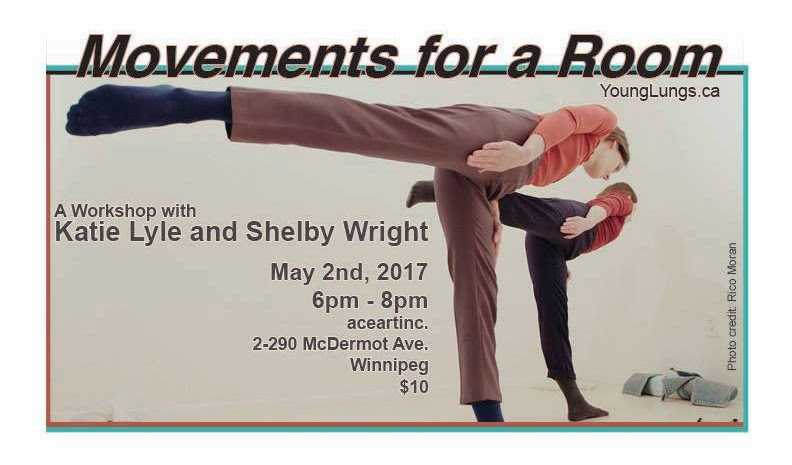 Lyle and Wright will present an interdisciplinary workshop combining movement and discussion, with an emphasis on collaboration, revision and choreography. Posing the question of how our movements change in relation to another person? How we experience duality in our bodies, exploring the process of watching versus feeling movement. The workshop will consider the character or role of an artist in the studio, how we might move and work in a space that is both private and public. Enacting the moment right before deciding to make something. Movement as a visual embodiment of the agency of ‘doing something’, of thinking, revising, starting over. Moving to the language of drawing and looking. Why dance now? Why the body now? To make something full of mistakes that is also perfect, or that combines both. To make something that appears unsure about every aspect of something. To create a performance or series of movements that show indecision. To create something that values indecision.